This 1980’s split level Transcona home needed to be updated from the original oak look. It was clear we had to design a kitchen space to maximize storage and brighten up the entire area. We removed the existing walls, dated lighting and eat-in area and set out to create a space that was both inviting and functional. 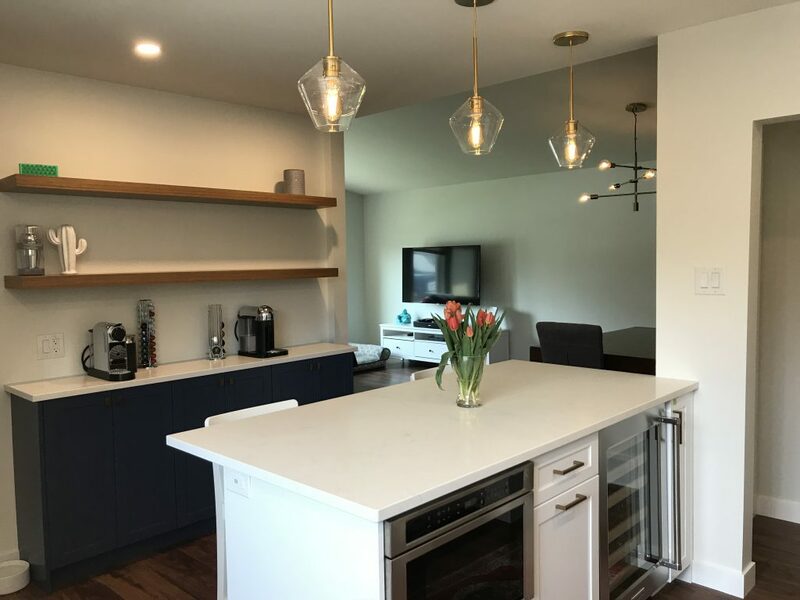 New flooring, a larger pantry, shaker style cream cabinets, pendants, pot lights, under cabinet lighting, quartz counters with an overhang for bar seating and a unique bench space made this kitchen worthy of being the focal point of the home. The transformation of this 100-year old kitchen is more a miracle than a renovation! From tiny, dark and dated to beautiful, bright and fabulously functional. A completely new work triangle was integrated with a butler style area created from the old kitchen. Natural light floods in, bouncing brilliantly off the French Roast finished wood beam, ceramic tile floors and Blanco Silgranite sink. 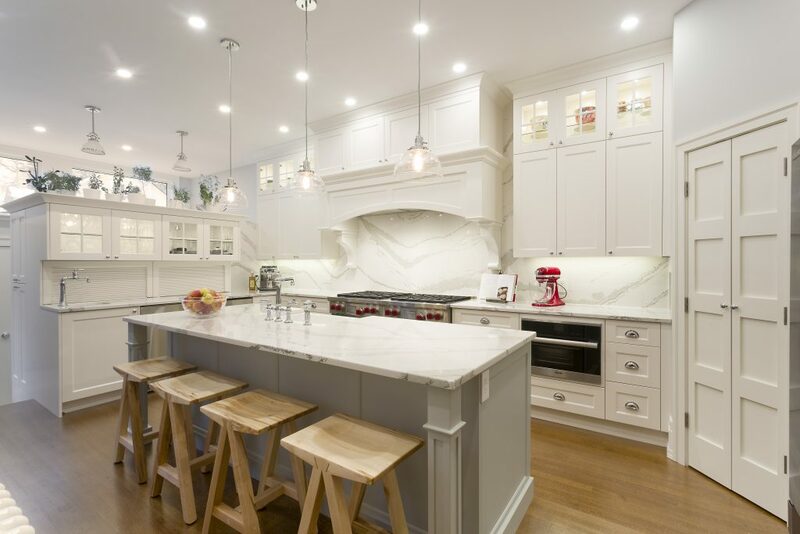 This kitchen has all the luxury and design you would expect in a fully modern kitchen, but look closely and you can help but notice the beautiful crown moulding for that traditional vibe. Walk into this beautiful bright mid-century modern kitchen and enjoy a top of line experience from stainless steel appliances to finishes. 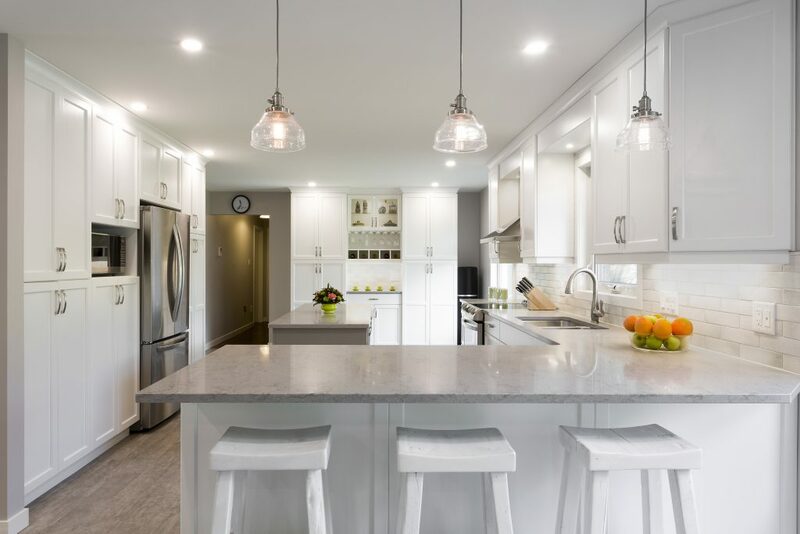 A wall was taken down, creating an open concept, light-filled space, with stylish function allowing the clients to cook and entertain comfortably. 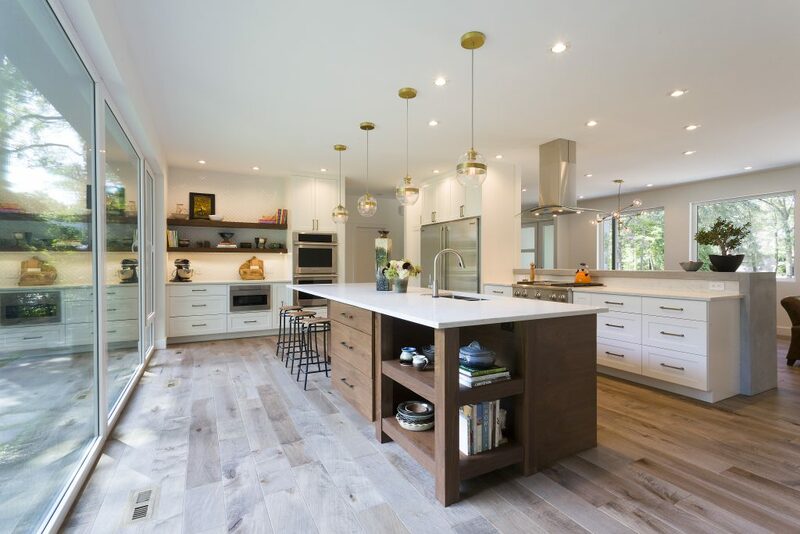 The design includes white shaker cabinets, white quartz counter-tops, white hexagon tile, gold hardware, a large island with a walnut veneer feature panel, medium wood-tone vinyl flooring and modern pendant lighting. 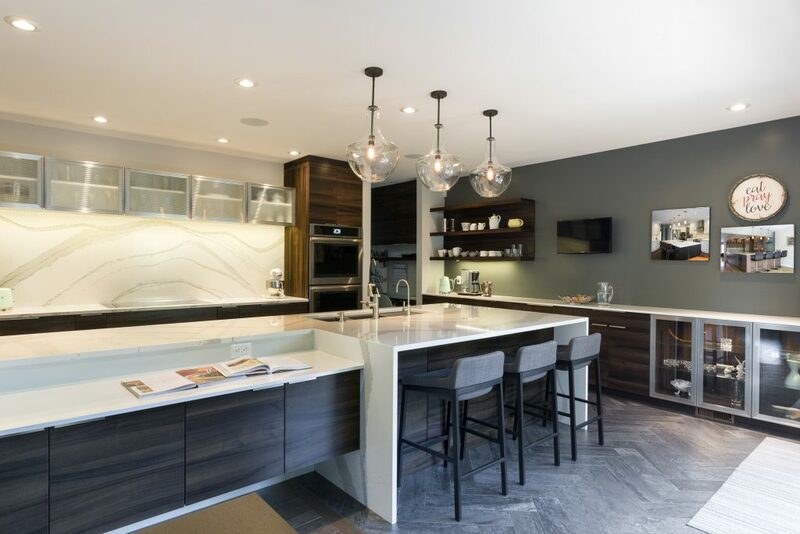 This custom two toned kitchen with grey lowers, white uppers & shaker style doors features a 40 inch x 96 inch island topped off with a gorgeous quartz counter top. The farm style apron front sink adds a beautiful touch to the kitchen. Large format subway tile & grey grout accent the kitchen. 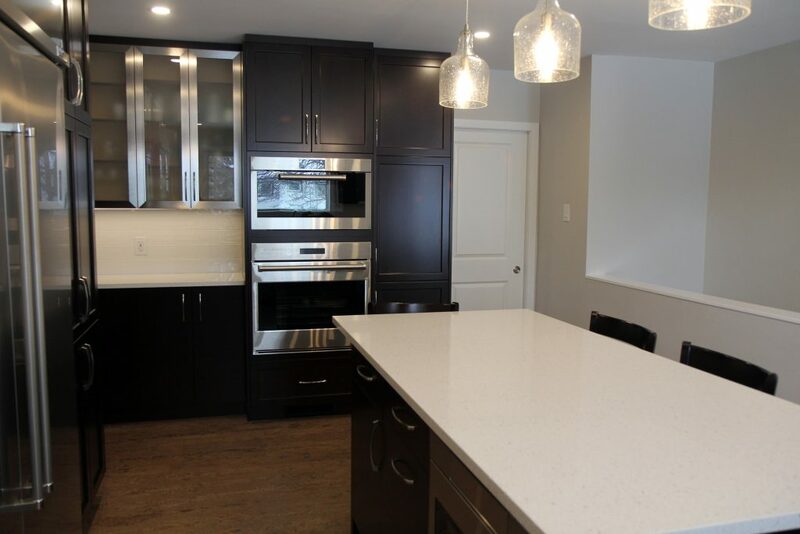 Stainless Kitchen Aid appliances featuring a gas stove & with under cabinet lighting bring in a modern touch. The whole kitchen is installed on top of a rustic look vinyl plank flooring. Creating an open concept space was the client’s wish. We removed a wall between the living room and kitchen creating an open concept dining and kitchen area. After moving the front door, we added a small peninsula for serving/breakfast bar. A coffee and beverage center was incorporated opposite the range. We were able to recess the fridge into the closet behind allowing for a better view from the rear sunroom into the new open dining room. The kitchen features an abundance of cabinetry and hidden storage. Natural lighting flows into the new space making it feel even more spacious! The owner wanted to update this beautiful turn of the century home. The dining room featured patio doors to a side deck and stunning floor to ceiling, custom designed, 3- way by pass, barn style doors which hid the pantry. The custom window seat and spacious island seating, allowed this kitchen to become the perfect entertainment space. 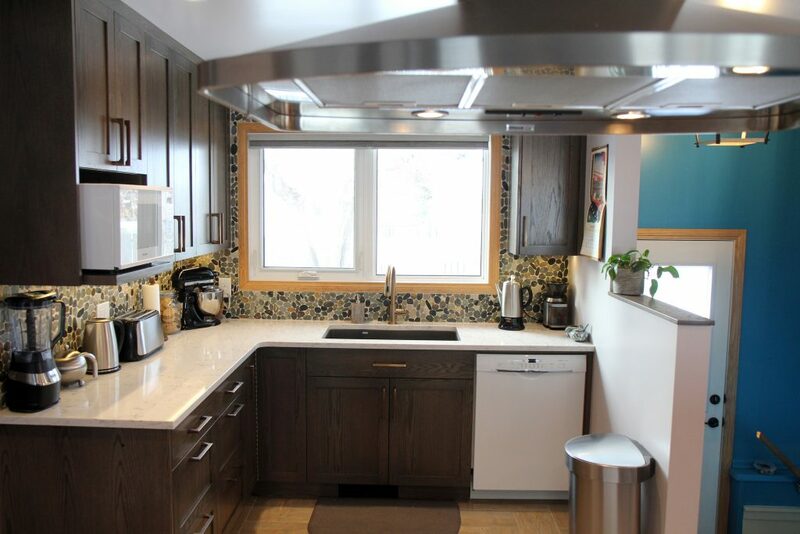 The large island featured a granite countertop and gas cooktop with a pop up down draft vent. 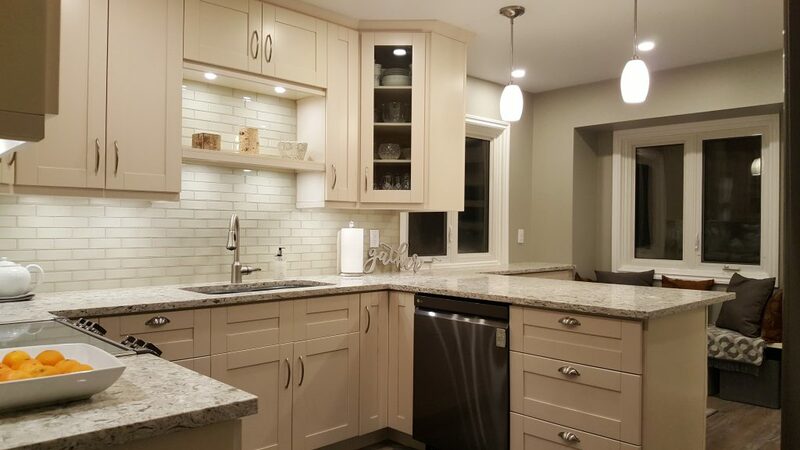 The lovely pop of red backsplash tile was only outdone by the fine detail in the traditional cabinetry to compliment the character of this lovely home. This small cramped kitchen had multiple issues. Father time had caught up with the cabinets and flooring, too many points of entry created many traffics paths through the kitchen, and too many walls separated the cook from visiting friends during parties. 2 wall beams and 2 posts opened the walls up to the living room and dining room. Removing a small framed pantry and closing off a doorway to the bedroom hallway allowed for enhanced appliance placement and an increase of cabinet space. Quartz counter tops, unique Pebble Creek stone backsplash and herringbone LVT flooring round out the kitchen upgrades. 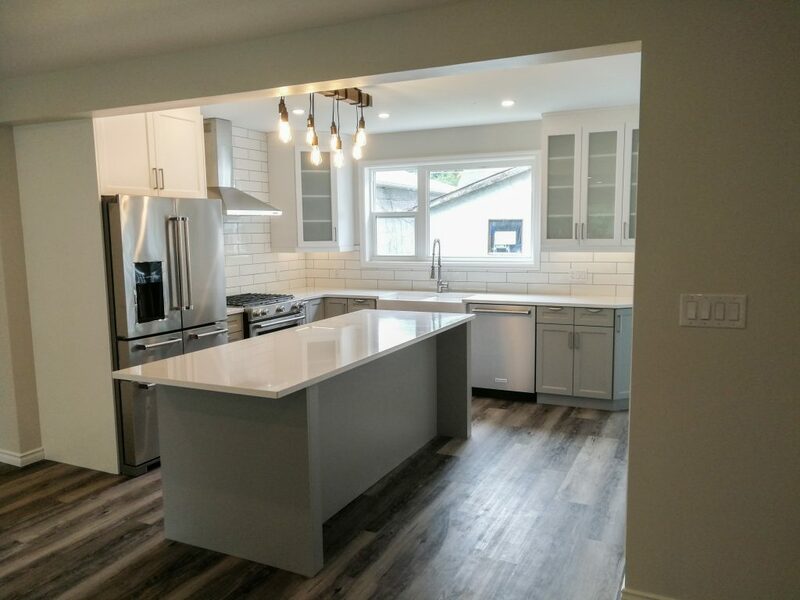 This kitchen project involved removing a load bearing wall, upgrading the electrical, plumbing, and dealing with a very crooked, 110 year old home! We were also able to open up a drop ceiling to expose a gorgeous cathedral ceiling. The ceiling was insulated with spray foam, we installed new LED pot-lights, re-finished a brick chimney, and installed beautiful custom cabinetry! The remainder of the main floor had us custom mill baseboards, casings and trims to match the existing ones from over 100 years ago. 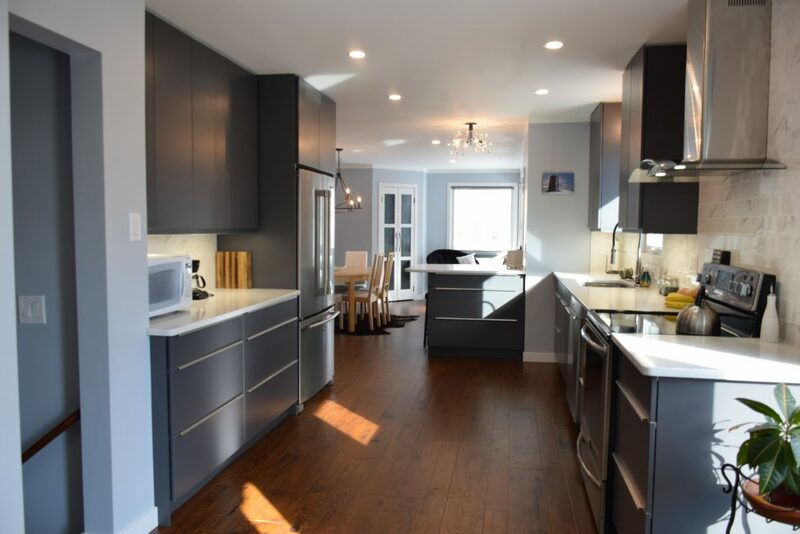 We installed vinyl plank flooring, and painted the entire area to complete this stunning kitchen! Incorporating rustic elements with functionality was our goal for this outdated country home on a beautiful acreage near Bird’s Hill Park. The client wanted a unique renovation to support their outdoor lifestyle while maintaining the character of the home. 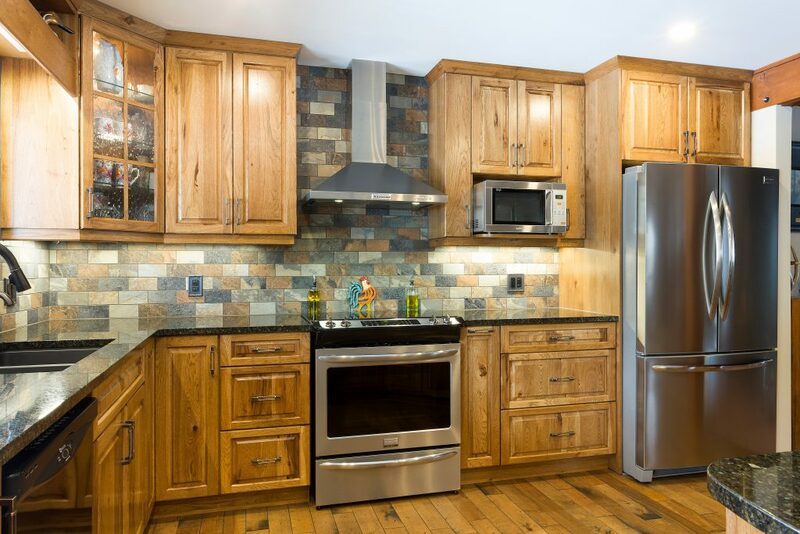 Solid hickory cabinets helped create this timeless renovation. The open concept with exposed pillars created their unique environment while the distressed hardwood floors flowed through the space to tie it all in. 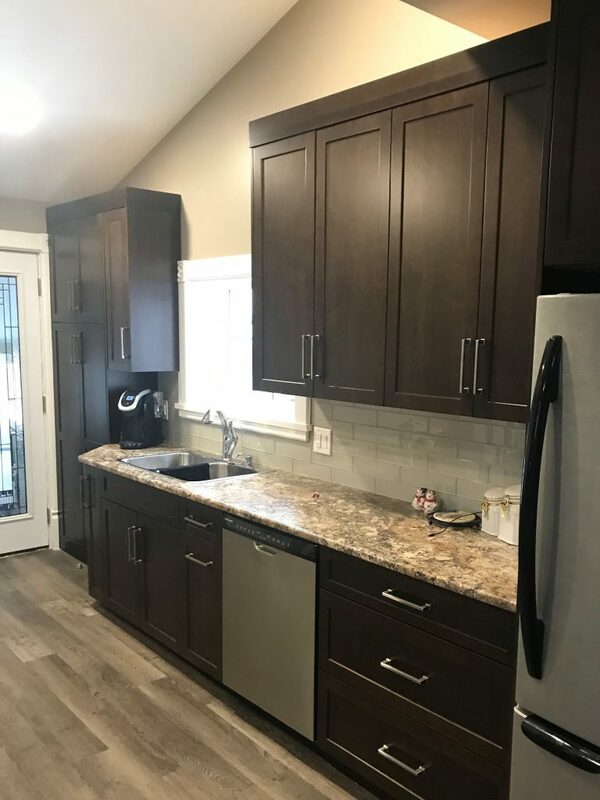 A large island and double sinks provided a larger area for food preparation and extra space for gathering of friends and family while swapping fishing stories. This kitchen has all the finer things you would want in a new and modern kitchen but with the unique detailing and charm of its proud heritage period. Enter through the main home and you’ll notice a well appointed wetbar with fridge, custom wine storage, and cabinets faced with striking glass mullion doors. Then you’re greeted with a warmth of a comfortable kitchen that just feels like home. 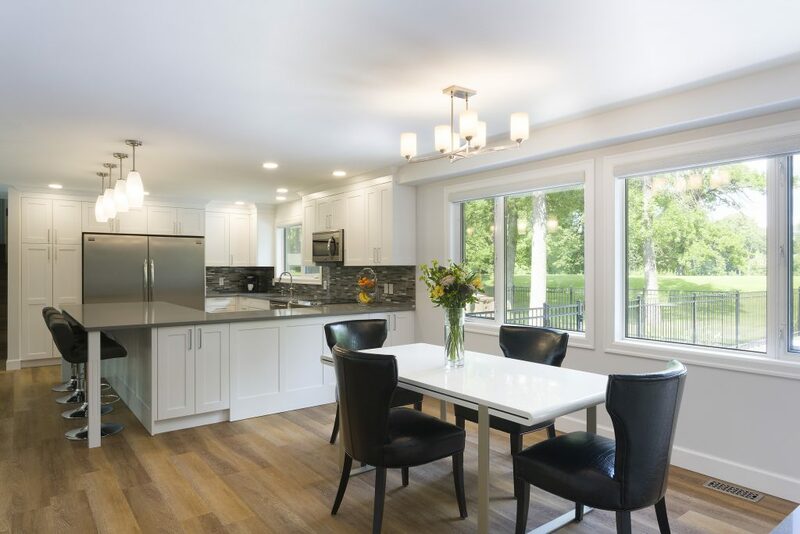 The large custom island is flanked by a Kohler farm style sink, Miele steam oven, Wolfe gas range, huge fridge with cabinet panels and all united with rich refurbished hardwood floors. This kitchen is truly an island retreat and a welcome change from the cramped dark kitchen of 1911. The new space has a huge island with counter height seating; a larger and far more efficient work triangle; double Wolfe Range; custom cabinets that extend to the ceiling for added storage; a bar with tambler doors, a wine fridge and bar fridge; extra large walk-in pantry, and a step down mudroom with more storage and a large utility sink. This island retreat has all the modern luxuries but the era style was meticulously maintained with some beautiful crown moulding. 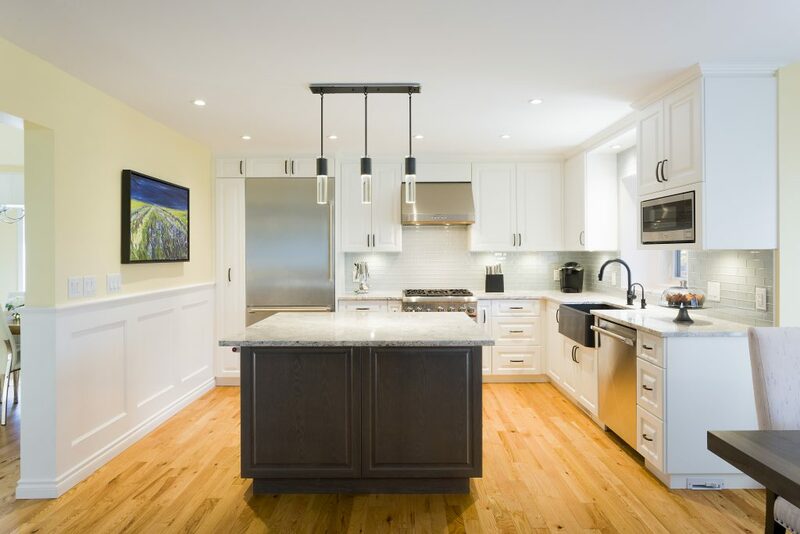 By removing the dining room partition wall we opened up this kitchen space to improve traffic flow and the re-designed centralized island and added bar-top peninsula increased counter space. We created a functional area for entertaining family and friends. Floor to ceiling custom white cabinetry, added pot lights and large windows increase the daily brightness of the room. 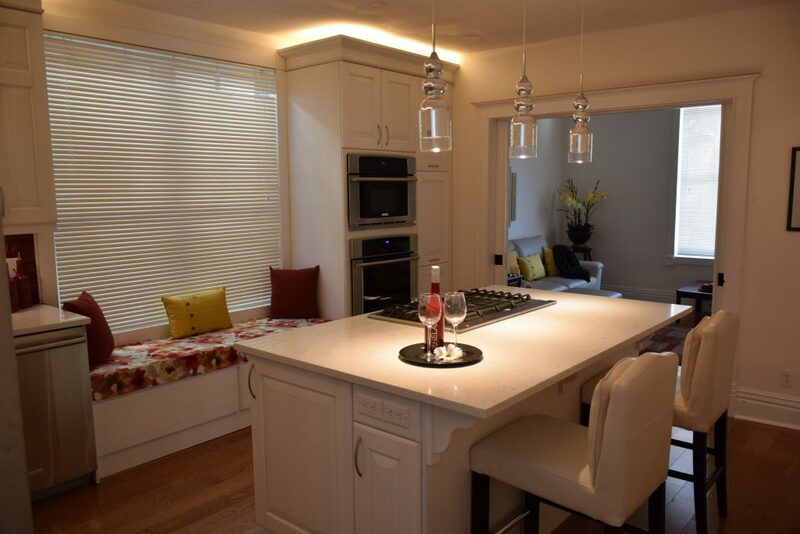 The added touch of under-cabinet lighting and pendant peninsula lighting compliment and control the evening ambiance. The combination of quartz countertops and custom tile back-splash both compliment and characterize a captivating flow through the kitchen. When you walk into this kitchen the first thing you’ll think is, “I could become a truly great ‘Chef’ in this kitchen!” The second thing you’ll think is, “WOW, and look at the stunning view!” This kitchen truly has it all; dual ovens, gas range, oversized refrigerator, huge double stainless steel sink, an abundance of counter space, cookbook shelf, easy access wine storage AND floor to ceiling 5-star views of the park-like river property. Add two-sided island seating, sightlines to the dining and great room and you’ve got a Chef’s Dream Kitchen! These client’s 60’s era bungalow had all the potential for a long term home except for the kitchen. Cramped and dated, only a full blown kitchen renovation, including enlarging the space, was the only option. An addition was built which increased the floor space by 96 sq ft. The extra space made a huge difference to the function and feel of the kitchen. Expresso Maple was the wood of choice for the cabinet fronts. 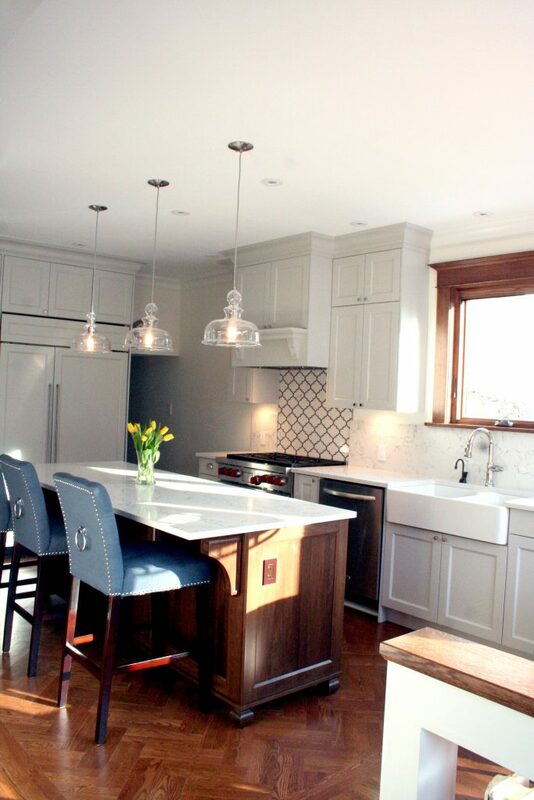 A white quartz and white backsplash contrast the dark cabinets nicely. The client’s love the look and feel of the click cork flooring they chose. Ahh, the 1940’s – think Humphry Bogart, the transistor radio and thermostat controlled heat! 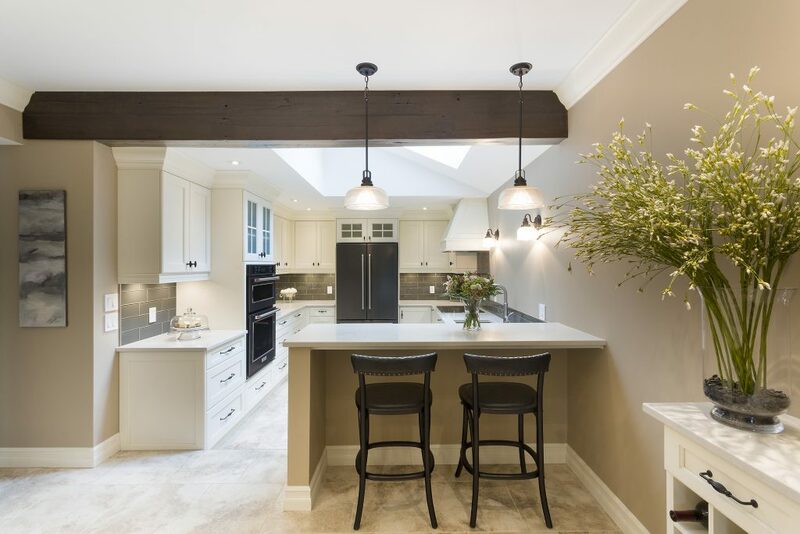 This home, built at the time was a jewel and this stunning kitchen renovation has brought it back to it’s prime. Features include: sleek symmetry and low profile of the overall design, walnut veneer on cabinets, ceramic tile flooring in a herringbone pattern, reeded glass in upper cabinets, vibrant brushed bronze plumbing fixtures, granite sink with two basins and drying station, coffee serving station with TV for daytime viewing and new 8′ sliding patio door off the kitchen for that all important flood of natural light. This project may look like it was a simple facelift to accommodate a classic styling, but in fact it included some crucial layout improvements to really get the most out of the available space. The placement of the oversized fridge and an odd cabinet divider between the dining and living room were problems that needed solutions. We relocated the fridge, moved the dining closer to the window to gain space for floor-to-ceiling pantries. New lighting, flooring and wainscoting completed the classic aesthetic. The new upscale appliances fit just right! Problems solved!